For those of us fortunate enough to have visited Yellowstone on childhood camping trips, it is a place strange and mysterious that lingers and tantalizes with memories of Old Faithful and bubbling mud pots, roaring waterfalls and secret hopes of spying a black bear or a bison; a real place that seems as though it could have been created in our dreams. 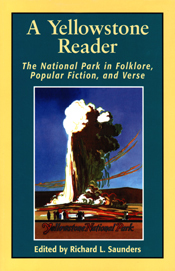 A Yellowstone Reader collects an evocative sample of fictional literature about Yellowstone—the best or most notable expressions of the niche Yellowstone Park occupies in the human imagination. Selections span the late nineteenth century through the 1980s and include fur trapper tales, short stories and serializations, a Victorian dime novel, young adult fiction, and a novelette published specifically for Yellowstone's tourist market. Each selection is accompanied by an editorial introduction providing useful historical and biographical information. If you are among the more than one hundred million people who have visited the Park, these stories will reveal a place both familiar and unfamiliar, presenting its geysers, mountains, and rivers from the perspectives of the past. And if you've never walked Yellowstone's boardwalks or witnessed its hot springs, these stories will introduce, divert, and entertain as they enliven America's oldest and largest national park. Richard L. Saunders is the author of Printing in Deseret: Mormons, Economy, Politics, and Utah's Incunabula, 1849–1851. He is curator of Special Collections and Archives at the Paul Meek Library, University of Tennessee at Martin.